Run the 2017 Falmouth Road Race on Thorty's Team. Join NHL forward Shawn Thornton as he steps off the ice and fights to improve the lives of those affected by cancer and Parkinson’s diseases. The Shawn Thornton Foundation is dedicated to helping find cures for diseases close to Shawn's heart, specifically, Parkinson's and cancer. The Foundation will work towards this mission by raising awareness, funding innovative research and helping to relieve the burden and improve the quality of life for patients and their families. Run for Thorty’s Team in the 2019 Boston Marathon® on April 15th, 2019. Shawn Thornton Foundation is a proud partner of the John Hancock Non Profit Program. 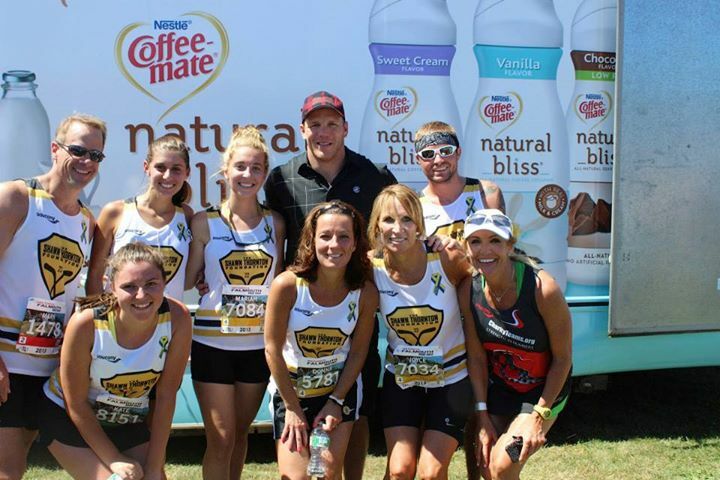 Thorty's Team will be running the 2018 Falmouth Road Race to benefit The Shawn Thornton Foundation on August 19, 2018. Join us on sunny Cape Cod this summer to cheer our team on! There are a few spots left on the team. The 8th annual Putts and Punches for Parkinson's Golf Tournament will be held August 20th at Ferncroft Country Club! For the past eight years the Putts and Punches for Parkinson's Tournament has helped raise money for organizations supporting the fight against Parkinson's Disease, including The Shawn Thornton Foundation and the American Parkinson Disease Association. Originally from Oshawa, Ontario, Shawn began his career in the National Hockey League at the age of 19 as a draft to the Toronto Maple Leafs. After moving to the Chicago Blackhawks for 3 seasons, Shawn made his way to Anaheim where he won his first Stanley Cup Championship with the Ducks. Shortly after, Shawn signed with the Boston Bruins where he was a key player for the black and gold. In 2011, he helped lead the team to a championship season and bring the Stanley Cup back to Boston for the first time in 39 years. While in Boston, Shawn took on a very active role in the community, becoming a fan favorite of many local residents. He is no stranger to public or media appearances and is extremely involved in the charitable world. He regularly visited local hospitals, sat on the board for a variety of charity events, and was a spokesperson for Athletes for Heroes, a program that supports the children of fallen or severely injured soldiers. In 2009 Shawn received the John P. Bucyk Award which honors the Bruins player who has contributed the most to charitable and community endeavors. Few players know the difference between playing in the minors and playing in the NHL as well as Thornton. In 2014 he became the third player to appear in 600 NHL games and 600 American Hockey League games and the first to reach that mark in the NHL after first doing so in the AHL. In 2014 Shawn was traded to the Florida Panthers where he continued his role as a team leader both on and off the ice. Shawn finally retired from a 20-year professional hockey career on April 6th 2017. Shawn now works for the Florida Panthers as Vice President of Operations. After losing his grandmother to a 14 year battle with Parkinson's and hearing the touching stories of so many cancer patients and their families during his hospital visits, Shawn was inspired to take the next step in his charitable efforts. He founded The Shawn Thornton Foundation in 2013 with the mission to help cure life-threatening diseases, specifically Parkinson's and cancer. As the Foundation's President and Director, Shawn works with his board of directors to improve the quality of life for patients and their families through various events and fundraising efforts. Shawn feels extremely fortunate for the support he has received throughout the years and looks forward to continuing to give back to the community that has always supported him. 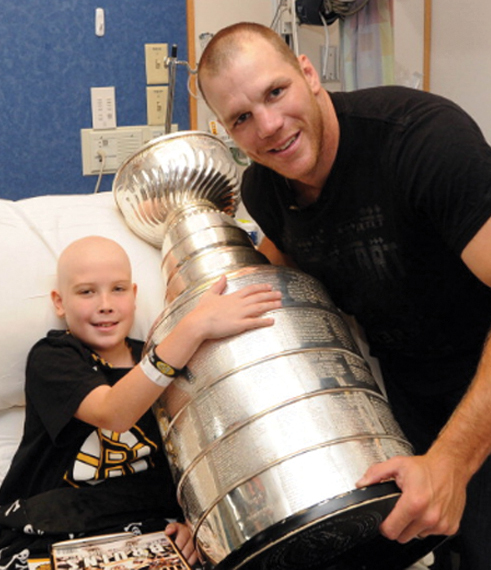 Your donation to The Shawn Thornton Foundation will help fund innovative research, increase awareness and provide quality care for patients and families affected by Parkinson's and cancer. The Shawn The Shawn Thornton Foundation is governed by a Board of Directors who shares a commitment to improving the lives of those affected by cancer and Parkinson's diseases. Led by President, Shawn Thornton, each Board member brings to the table unique expertise and experience that collectively provide the leadership and guidance vital to fulfilling our mission. © 2019 Shawn Thornton Foundation All rights reserved.